This easy appetizer takes only 10 minutes to prep. 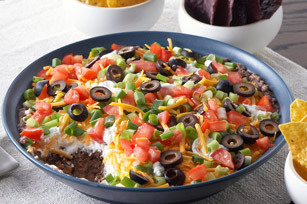 Topped with sour cream, cheese and chopped veggies, this Mexican bean dip pairs perfectly with crunchy tortilla chips. Mix beans and seasonings until blended; spread onto bottom of 9-inch pie plate. For a spicier dip, add hot pepper sauce (to taste) to the refried bean mixture.